Center Sachsenallee is a shopping arcade featuring a variety of shops and entertainment options in the town of Chemnitz in Germany. 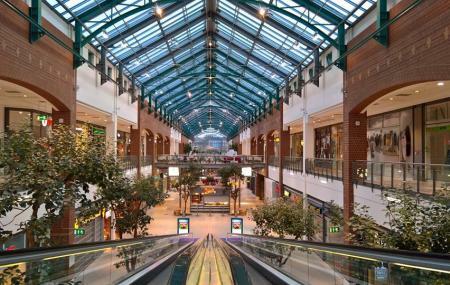 Major international fashion brands like H & M, Media Markt, Intersport, Bench, Douglas and much more have their stores here. A few of the shopping options at this mall are bakery, beauty & cosmetics, books and magazines, health, clothes, jewellery, confectionery, fashion, and telecommunications. From fresh Asian cuisine to delicious ice cream and coffee specialties, to the American comfort food – Pizza, you will be spoilt for choice when it comes to the gastronomical scenes. How popular is Center Sachsenallee? People normally club together Naundorfer Tonloch and Jakobikirche while planning their visit to Center Sachsenallee. After the renovation it became my favourite shopping mall. The food lounge is very diverse: Vietnamese, Pizza, KFC, sea food and more. You can find the usual clothing, electronics and shoe shop too, but it also got some unusual shops. And lastly it got a free parking house. we'll get everything here, all groceries.